a. Shirt Sabine’s upper clothing consists of a black or charcoal grey long sleeve top with mandarin collar. There is a second short sleeve garment worn over the top. Short ” faux” sleeves sewn to the long sleeve shirt are acceptable in lieu of a second garment. The front of the outer shirt has a grey or silver panel approximately half the width of the observable waist line when viewed front on, narrowing slightly before expanding into a “Y” type shape before it extends beneath the armor. The rear of the shirt has a grey or silver panel that frames the “black” of the shirt to form a ” rounded mountain” shape. The black mountain shape cannot be too” flat” but should have similar height as it is wide. Please refer to reference shots. Fabric used needs to be stretch material or tightly fitted. b. Pants The pants are also of stretch material or tightly fitted. They consist of a khaki or muddy brown color with lighter inner panels extending from inner mid thigh to the waist line, front and back. The lighter inner panels need to have a slight curve to the vertical-to-horizontal transition. That “corner” should be slightly rounded, not squared off in both front and back The color of the inner panel should be a slightly lighter version of the main pant color. Over contrasting colors such as brown and cream are incorrect and should be avoided. The lighter inner panel should be the same width as the grey panel of the shirt and ” line up ” at the waist line. Some flexibility is afforded here as the juncture will be concealed by the double belt. a. Belts Sabine now wears two belts. The lower belt is her original from season 1. It is brown leather or leather like and joins in the front via a rectangular silver buckle the same width as the belt. The buckle may be of alternate material as long as it is painted to give the appearance of metal. The buckle has a narrow rectangle shape etched into the upper section. Marking this with other methods is acceptable if the appearance is accurate. The second belt sits on top of the first belt and is approximately 1.5 times as wide. It has a darker line running the length of the belt down from the top edge and an identical marking above the lower edge, also running the length of the belt. The buckle is slightly larger than the actual belt and is adorned with a parallelogram shape etching. b. The upper belt carries many accessories. The first, are two large pouches worn on either hip. They are 2.5 – 3 times longer than the width of the upper belt and approximately 1.5 times as wide. They have a single, thin rectangular, silver adornment on the closed flap. Metal may be used or silver paint is acceptable for all pouch closures. Across the rear of the belt, situated between the two large pouches are 3 smaller pouches. These pouches are the same color as the belts and large pouches and have a small silver circular closure proportioned to the size of the pouch. The pouches are similar in size to the width of the main belt. The final element of the main belt is the commlink holder. This is a section of leather the same width as the main belt that forms a vertical cylinder to hold the commlink in place. It is attached to the main belt and has the same two ” markings” as the main belt just inside the top and bottom edges. c. There are two holsters to house Sabine’s Westar 35s. Holsters should be of leather or leather like construction. The same color as the belt, pouches etc, they have a curved outer “sweep” to the shape of the panel that sits outboard of the holstered gun. The bottom of the holster is ” open” to allow the muzzle of the gun to protrude. The holsters are attached to the bottom, thinner belt via a ” strap” to the front and a strap to the back. Directly below all attachment points, is a horizontal metal strip approximately 6 mm wide (but proportional to the wearer’s size) that runs the width of the strap. On the front two connection points there is also a vertical strip of metal sitting in the middle of the horizontal strip. This adornment is attached to the belt itself and is as long as the width of the belt. The two rear connections have no vertical strip present. Metal is preferred though other materials painted silver are acceptable if it achieves the correct look. d. Sabine wields two Westar 35s. These may be 3D printed crafted from timber or constructed by other methods available to the applicant so long as they look correct and are painted accurately. The right gun has a yellow base and the left gun a light blue base but the detail of the paint scheme is too detailed to describe via a narrative. Members will need to consult the reference images when painting their Westars to achieve the required appearance. Whilst it is not required, if a candidate wishes to include electronics/LEDs, Sabine’s guns emit red light from the barrel when fired. e. Leather or leather like black gloves that are fitted until the forearm before flaring slightly wider. They should be painted in accordance with the reference pictures (primarily purple and orange splatters) to achieve a similar look as Sabine. There is a small section of leather, similar in color to the belt, that sits on the top of the left hand of Sabine between the wrist gauntlet and her hand armor. 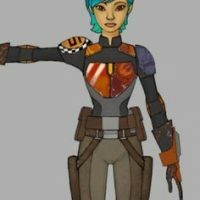 f. Season 2 sees Sabine adopt wrist ” Gauntlets”: The left gauntlet comprises an orange base gauntlet passing around the wrist with a grey sided LED screen. Electronics are not required but the screen of the gauntlet should either be painted light green to simulate an electronic screen or painted one of the three images from the series that alternate across its face. Just forward of the main LED display are 4 light green triangles. The right hand gauntlet is again basically orange base color around the wrist with grey sided screen but has two LED screens on the top surface with a small LED either side of the main setup. The outboard side LED (RHS) is of iridescent blue. The inboard LED panel is iridescent blue for the top half but displays black for the bottom half. The top forward screen of the main LED displays a black background with a series of red elliptical lights that are aligned in a vertical row. The panel behind displays an arrow and rectangular figure on a traditional light green display. Final paint scheme and weathering should be consistent with reference images. g. Black wedge heeled boots extending to just below the knee. Zippers are acceptable but should not appear on the outside of the boot (i.e. inside calf) paint scheme should be similar in color to the gloves (purple and orange splatters) and should approximate the appearance of reference images. h. Around the top of each boot is a series of leg flares. The leg flare holder is a light mission brown that holds a serious of cylindrical, silver flares. The size of the flare should allow approximately 14-18 flares side by side to surround the top of the boot. The flares should protrude slightly from the ” flare belt” top and bottom. Sabine’s paint scheme, as well as the weathering of her armor is her trademark. Her signature and a large part of her personality. It is extremely important that members creating this costume give the time and consideration to the appearance of each individual piece. Whilst it is not possible to recreate every scratch and nick, weathering representative of the armor seen in screen shots and reference images is required. Likewise, it is not possible to perfectly recreate the exact paint scheme from the Series, nor do we expect you to. The costumer must however, capture the main characteristics specific to the individual piece to successfully represent the character. For example, The left chest piece is burgundy background with an orange/yellow Rebel bird symbol in the upper right corner surrounded by three concentric circles of the same color. The circles have two ‘steps’ in their circumference. The right chest piece has more of a dark red as its base and is characterized by two white stripes running diagonally across its upper left portion. Appropriate weathering required. As far as the Armor goes, these standards won’t run through every single color displayed on the costume. Like any creation it is expected that you will research carefully and refer back to the reference pictures throughout the build. They will however run through what the judges will be looking for in each piece during the assessment process i.e. general color scheme, characteristics of the paint work for that piece and appropriate weathering. All Armor must have appropriate weathering. a. Chest armor Two symmetrical pieces proportional to the wearer, slightly separated from each other covering a large portion of the chest. A third smaller piece fits in between the two larger sections and should be approximately three times as long as it is wide. Paint Scheme: The left chest piece is a burgundy background with an orange / yellow Rebel bird symbol in the upper right corner surrounded by three concentric circles of the same color. The circles have two “steps” in their circumference. The right chest piece has more of a dark red as its base and is characterized by two white stripes running diagonally across its upper left portion. The lower dark red portion is now mostly covered by a splash of orange. The center “chest diamond” is yellow. b. Shoulder armor Two pieces, one either side of the neck running from the front of the chest, across the shoulder to the back. Paint Scheme: The left piece is orange base with a burgundy influence towards the front and has a burgundy line running from front to back. The right piece is orange base with a pale yellow line running around the edge that is against the wearer’s neck. It also has 2 pale yellow lines running from a yellow geometric across its bottom outside corner. Appropriate weathering required. c. Shoulder bells The shape of the left and right shoulder bells is a curved upper edge with a relatively straight bottom edged section that surrounds the wearer’s shoulder. Paint Scheme: The left shoulder bell is a purple base with a black outline of a fish. The mouth of the fish is colored pink. The right shoulder bell is a black and white checker board background surrounding an orange oval. A burgundy line boarders the oval. Inside the oval is a horizontal burgundy rectangle sitting on top of a burgundy sideways “U” both shapes are boarded by a pale yellow line. d. The hand plates are a non symmetrical hexagon with the longest side being toward the front of the hand. Paint Scheme: The left hand plate is orange base with a pale yellow partial circle in the upper left corner. It is surrounded by two concentric burgundy circles, one thicker than the other that have a ” step” in their design. The right hand plate is orange base with a diagonal yellow line across the middle. The section to the right of the line is more burgundy with purple splatter. e. Each arm has two pieces of armor. One just above and one just below the elbow. They are secured with a wide piece of black elastic surrounding the arm. When the arm is straight, the respective pieces should almost be touching. As the arm is bent, the armor will naturally separate and move further apart. Paint Scheme: The left hand set consists of a base orange piece on top with more a base burgundy piece on the bottom. Running across both pieces is a thin yellow line on the left along with a thicker yellow line to the right of the thin line. The right hand set is base orange with significant wear showing. f. The knee guards are a single piece of armor that attaches to the leg through a wide piece of black elastic. Paint Scheme: The left knee guard is orange base with burgundy accents. The right knee guard has an orange center section boarded by two yellow stripes ( one either side of the orange section ) and finished with burgundy extending to the edges. g. single piece of armor that attaches to the top of each boot where the leg transitions to the foot. Sabine’s hair has dark blue / purple roots, that blend smoothly to an iridescent Aqua at the tips. The hair or wig should be cut short and styled to resemble Sabine’s look. 1. Sabine’s sprayer should be of appropriate size and have a red rocker switch in front with 5 silver ” buttons” down the side and a silver gas canister at the rear. It should be accurately painted with paint splatters around the nozzle and face. 2. Mandalorian helmet with distinctive shaped “eyes” and a range finder on the right hand side. Paint Scheme: There are at least six colors featured on Sabine’s helmet. It is a complex but beautiful design. It isn’t practical to describe the exact design through narrative so candidates of this costume will need to study the reference images in order to reproduce the helmet accurately. 3. The commlink itself is similar to that seen in ANH but has a longer more cone like section as the speaking end but instead of white and black, is silver and black. Flexibility will be given in the construction of the commlink. The commlink is almost entirely hidden by the leather holder so a Star Wars commlink of reasonable accuracy will be acceptable. Written by by Shay Kenobi, TrooperPX & Stardancer1914.